Need to save cost for international text messaging? What about the HeyWire? HeyWire is a text messaging application from MediaFriends which lets the users to send free text messages to anyone in their texting circle around the world. 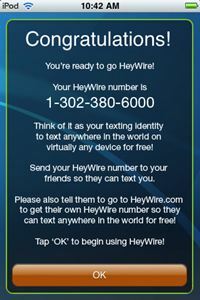 The Heywire has been designed to allow the users to send and receive texts over their PC, MAC, iPad, iPod Touch and iPhone. Besides that, its also lets the users to send and chat with Facebook friends or Tweet on Twitter while they are texting. In order for users to identify their identity, each user will given a real phone number for sending and receiving free text messages between Heywire users. Simplify messaging experience – text messaging, Facebook Chat, Twitter and IM. Create and send the same message via text and Facebook Chat simultaneously. A real phone number as your texting identity. Fast and reliable message delivery. Message listings with pictures of your contacts. Incoming message push and sound notifications. Texting to up to 10 contacts at once. Global coverage when messaging with other HeyWire users. Coverage in 114 countries through 360 operators when texting non-HeyWire mobile subscribers. Supports all major languages, including character based ones plus emoticons when messaging other HeyWire users. Ability to text and chat using the mobile data network or Wifi. The Heywire application for iPad, iPod Touch and iPhone is available for free download from App Store. However, the PC or MAC user also can register from here to access the web version of HeyWire for free text messaging.